Your brand new custom swimming pool can be created in a variety of different shapes and sizes. Your brand new custom swimming pool can be created in a variety of different shapes and sizes. Your pool from Honeysuckle Nursery and Design will be custom designed based on the size and shape of your yard, the type of pool experience you want, and your own personal style. You’re going to spend many years enjoying this new addition to your property, so you want to make sure everything is just right! Most of the time when you see an oval-shaped pool, it is quite large. As the name suggests, this type of pool is just a big oval. In the old days, you could frequently find an oval pool in the backyard of Victorian homes. A modern oval-shaped pool can be used to create a “backyard oasis”, complete with rock formations, waterfalls, and palm trees! The “kidney” shape refers to a swimming pool that is similar to the oval in that it is curved at both ends, but where the oval is straight on both sides, a kidney shape curves inwards on the one side. A kidney-shaped pool tends to have more of a natural feel due to its irregular shape. A figure 8 pool is round on both ends and goes inwards lightly in the middle. One thing that figure 8 pool owners like about this shape is that the water has a chance to flow quite freely around the rounded sides. It is great for just floating along on a hot summer day. 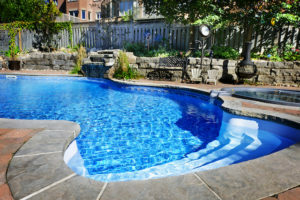 With Honeysuckle Nursery and Design, we manage every aspect of a pool project including pulling permits to customizing your pool with various features such as waterslides, waterfalls, sheer descents and more. Our pool designers will work closely with you to understand how you want to use your space so that we can make the most of your entire site. Whether you are looking for a luxurious heated in-ground pool or a small plunge pool or a lap or infinity pool, we will bring your vision to life! Whether you live in Anne Arundel or Howard Counties, we can help you experience your dream space in Annapolis, Davidsonville, Millersville, Ellicott City, Clarksville, Columbia, and surrounding areas. We specialize in landscape design & Maintenance, Swimming Pools, Hardscape, and Natural Stone, Water Features, Outdoor Living Spaces and more! Dream, Create, Experience with Honeysuckle Nursery &Design by calling 410-849-5119 or email us to schedule your free no-obligation estimate today. Don’t forget to follow us on Facebook, Twitter, Houzz, and Youtube! This entry was posted on Friday, April 12th, 2019 at 4:07 pm. Both comments and pings are currently closed.